Cleansing – This is done with a simple soap and water. Before you can move onto the toning and moisturizing you MUST get rid of all the extra dirt you have accumulated throughout the day AND night. itiba has many soaps that can be used to aid in the cleansing of your skin. I recommend Carib Lime if you have oily skin. The Lemongrass Essential Oil contained in the soap helps the skin to regulate the sebum produced. That combined with the French Green Clay works to break up the excess oil and leave your skin feeling lighter and brighter! For normal skin, Island Rose or even Papaya will work wonderfully. For combination skin, MidNite Rain, Crucian Spice or Sea Lavender are all wonderful choices. Toner/Astringents – these are the same thing but a different name applies to your skin type. Astringents and Toners help to take away excess oils from the skin, in particular the neck and face. Toner is the term used for products for skin that is in the normal to dry range. Astringent is the term used for skin that is in the normal to oily and oil skin range. The astringent is stronger than the toner because it has to break away more oils from the skin than the toner. Moisturizing – is done after we clean our skin. This step is done after we have applied either our toner or astringent to our skin. Even if you have oily skin, you will still want to moisturize it. When moisturizing the skin, stay away from products that will clog the pores such as mineral oil, petroleum jelly, and yes even cocoa butter for some people. If you suffer from oily skin, it is recommended NOT to use cocoa butter on the face and neck. However, a wonderful oil to use, yes…I did say oil…is Jojoba Oil. In fact, Jojoba Oil is really a liquid wax and pound for pound, can be called the Fountain of Youth for our skin. Jojoba Oil is the only vegetable oil that very closely resembles the sebum that our skin produces. I like to call it a second skin that helps our own skin do its job better. I am not a fan of mineral oil as I do not see the long term benefits of this oil. In some cases, it has been stated that mineral oil can cause clogged pores and dermatitis. There is the cosmetic grade mineral oil that is used in skin care, but there are other wonderful oils like Castor Oil that can do the same and offer better benefits to the skin. Any of itiba’s six lovely fragrance body lotions will make a wonderful moiturizer. Hydration – very simple! Our bodies are made up of about 75% water. We need to keep our skin hydrated from the INSIDE as well as the OUTSIDE. Our skin looses upwards of 2 PINTS of water daily. We need to drink upwards of one gallon of water daily in order to maintain optimal hydration for our bodies.Water does a body good! 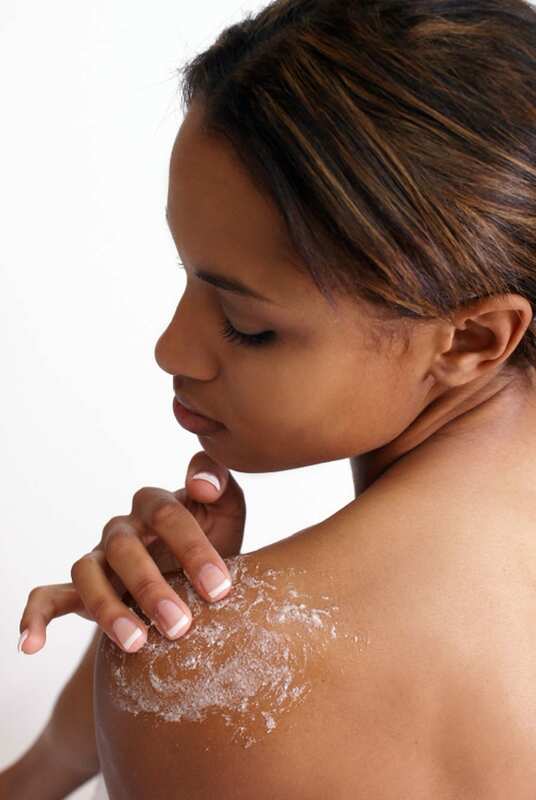 Exfoliation – In order for our skin to shed the dead skin cells easier, some type of exfoliation should be done. There are several ways this can be done and depending on the part of body different materials should be used. Using a salt or brown sugar scrub is a great way to exfoliate the body. Ground oatmeal, almond meal, even ground avocado seeds can be used to exfoliate the skin. Ground oatmeal, almond meal, and sugar can be used on the face and neck. But beware, the skin on these areas is delicate, do not use too much force or friction. Slow and gentle is all you need when exfoliating your face and neck. Another method is DRY BRUSHING. This offers more than exfoliation; it also offers increased circulation to the skin and in certain instances a healthier lymphatic system. itiba’s Body Polish all made with Caribbean Sea Salt, unrefined Shea butter and scented with itiba’s unique blends, to include the latest Kaya Body Polish – made with brown sugar, local island honey and decadent Shea butter, are all great exfoliators. AND you get the extra added benefit of moisturizing with the Shea butter! REST! – I think this is self-explanatory. Get your 8 – 9 hours of sleep each night. Nothing less. Your skin (and every one else) will thank you for it! Come to St. Croix and relax on any of the wonderful sandy beaches and enjoy the cool Tradewinds as it wafts off the azure blue waters of the Caribbean Sea. String up your hammock and simply…rest! I would be remiss if I did not talk about DRY BRUSHING. What is Dry Brushing and what are the benefits? How should it be done? First Dry Brushing is a form of exfoliation. It helps the skin remove the dead skin cells so that the new ones may shine through. Dry Brushing, if done properly and consistently will also help to keep the skin properly eliminating the waste. There are many different ways to do the actual dry brushing, but a few things are constant and NEVER change. ALWAYS and ONLY use NATURAL bristle brushes. What are natural bristle brushes? These are made from either plant or animals. Depending on the type or bristle, you will use it on different areas of the body. Some examples of natural bristle brushes are boar’s hair, ayate – which is made from a large cactus called agave whose leaves are dried and made into fibers – sisal, and even coconut. NEVER SCRUB when doing a dry brush. That can be considered overkill and both are forms of exfoliation. Either you dry brush or you use a scrub. You must use some pressure, but never scrub the skin. Brushing activates the pores in the skin to remove more waste materials like uric acid crystals, catarrh, and other acids and impurities more efficiently than soap and water. Brushing increases and stimulates blood circulation in all the underlying organs, connective tissues and lymphatic system. Brushing revitalizes and increases the capacity of the skin to eliminate toxins from the system. Brushing stimulates hormone function – especially the oil producing glands. By keeping the pores open, the skin is better able to retain its natural oils and to breathe! Brushing has a powerful rejuvenating influence on the nervous system as it stimulates the nerve endings in the skin. Brushing contributes to better muscle tone and better distribution of fat deposits within the tissues. When I Dry Brush, which should be done at least three times a week, I start from my hands and work in slow, deliberate circular motions toward my heart. I am trying to follow the pathways of the Lymph System. I do the same with my feet. I start from teh soles of my feet and slowly work up in a slow, deliberate, circular motion (circular to the left) towards my heart. I keep doing this until I am doing with a fair amount of pressure. When finished, my skin is glowing and I am feeling so alive and refreshed! ALWAYS do your Dry Brushing BEFORE your shower or bath. Remember, this is a form of exfoliation and you have just released a lot of dead skin cells that you now want to get rid of and cleansing the skin afterwards is the best way to do so. Dry Brushing is ONLY effective when done on DRY skin. You now know my seven steps and secret weapon to having healthy, glowing skin.